Not appearing for me on mobile. You need Unofficial Dark Theme. Okay, I just realized something: what if I want to unwatch a thread and also don't want to keep getting notifications for that thread when someone quotes me? Tough luck. You can turn off notifications altogether, but not per thread. They might be having problems with the media embed forum extension. edit: clicked on wrong section! In this vein, does embedding tweets give them more "views"? Or allow Twitter any tracking info? It was enabled very briefly while we were working on some Twitter implementation. Unfortunately, they will not be back anytime soon. Just YT and Twitter for now. It's kind of an all or nothing type of thing right now in terms of the embedding. Because the mobile version uses the regular version of the theme - just scaled - there isn't much in terms of enabling certain things for one over the other. You can unwatch a thread (either delete it from your watched threads, or unwatch from the thread itself) but quote notifications are globally enabled I think. I'd suggest you to look into a solution that imports the tweets so not external data needs to be loaded for them and the tweets don't get lost once removed on twitter (the main reason why tweets were previously commonly included as screenshots instead just copied text with links). First and foremost, this site, the updates, the transparency of changes, the moderation, the admins, etc. are all TOP NOTCH. One suggestion: can anything be done about screen real estate on mobile (especially within each sub-forum)? The title of the first thread you can visit doesn't start until about 4/5 down the screen? I'm on a Samsung Galaxy S6 so it may just be me. Bold thread titles any time soon? Tired of scrolling down threads like they're unread. Anyway to get the active forum we are on in the breadcrumb bar highlighted? Nope, I still get notified when someone in an unwatched thread keeps quoting me. What amazing post did you make that so many people keep quoting you? The one where I ask how I can turn off notifications for getting quoted in unwatched threads. Is it possible to see the thread when you're replying in the ''more options'' page? It was really useful in the other forum when you could see all the latest posts right before you reply. Also a link to go back to the same thread would be nice. Great additions, keep em coming! Not seeing the bottom bar with shortcuts on Safari desktop or mobile. As well as Chrome desktop or mobile. Sorry if it's been posted, but is there any chance of a night/dark theme being offered? Specifically for the mobile site. Seems like it. I don't mind since clicking once (on the Edit button) is less effort than double-clicking anyway. Request: a public list of topics/people/games/whatever that can't be discussed on this website, on pain of moderator wrath. You can turn off notifications when someone quotes you altogether, but I don't thing you can do it by thread. Whom shall we reach when we want a thread title edit? Report the (better your own) OP, you'll then be able to write a message that is visible to all mods. I don't know if it's already been asked, but is it possible to change the timestamps from a.m./p.m. to 24-hour? 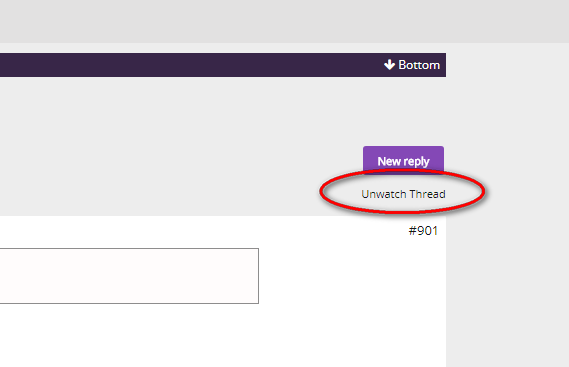 100% one of my most wanted features is unread threads being bolded in the list view of a sub-forum. is there a way to have the option to still double tap your post to edit? or is my browser just wants to die. Please add the forum icons breadcumb to the bottom as well. Is it possible to add a wall of shame? I noticed I was mentioned in another post, but it didn't appear in my notifications. Was this disabled to avoid abuse? Btw, is there a way not to have spoiler tags open up on a new line? It's breaks the flow of posts if you have spoiler tags in the middle of your sentences :/ Would be better as the usual grey/black bar like on other places. Maybe they didn't add an "@" to your name. I recall seeing something maybe a mod or admin post(?) indicating that a mobile update was on the to-do list. I can’t seem to find it in the latest community update thread, does anyone else recall seeing that? Or am I imagining things? I guess you could use the color transparent to type the spoiler but since it's not a black bar people might not notice they have to highlight something.